First appearance: The Machin (pronounced "may-chin") stamps, first issued on June 5, 1967, are based on a sculpture by Arnold Machin (who recently passed away in 1999). The simple design consists of a profile of Queen Elizabeth II and a value or service indicator. Some bear a heraldic symbol (the regionals). 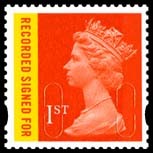 The series came about as a result of an effort to simplify and streamline British stamps. 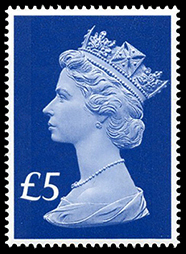 In 1967, it became established practice to show a small profile of the Queen, most often a silhouette, as the identifier on British stamps (until then, a full-size portrait of the monarch was required). Along with the sheet stamps, booklets (typically containing multiple values) and coils (again containing multi-values) have been issued. The latter two formats are typically cut down the middle of the perforations, which, for the specialist collector, creates an identifiable variety compared to stamps torn from sheets. Engraved Machins: In 1969, the pictorial high values showing castles were replaced by larger, engraved stamps with the Machin design. Since individual values could no longer be easily identified by design alone, each value currently on sale had to have a colour that was distinguishable from all the others. As a result, a wide range of colours have appeared. Decimalization: British currency was decimalized in 1971. The letter "p" was used to indicate decimal pence rather than the "d" used for the previous Sterling pence issues. Regionals: Regional stamps for Northern Ireland, Scotland, Wales & Monmouthshire, and Isle of Man made their appearance at this time. Heraldic symbols, representative of each country, were placed in the upper left corner of the stamp. This required that the image of the Queen be slightly smaller than that previously used. Different printers: As the years went by, and inflation grew, more and more values appeared. What used to be "high-values", in large stamp-sizes became low-values in the conventional small-size design. As well, two new suppliers of stamps were required to meet the demand of stamp production (previously only Harrison & Sons printed the Machins). The House of Questa and Waddingtons Security Print began producing Machins in 1980 - both used lithography instead of photogravure - the former being perf 13½ x14, rather than 15x14 (thus producing more varieties!). Narrow values: Newly designed numerals (narrower) began to appear in 1983. These were required because the larger values (eg. 20½) took up too much room on the stamp! Many values have been withdrawn and then re-issued in a different colour years after, as postal rates dictated their need. The 20p holds the record with four different colours. Non-denominated: In 1989, non-denominated Machins appeared (referred to as Non-Value Indicated (NVI) stamps). These simply carried "1st" or "2nd" indicators, denoting the class of service that was paid for. 150th Anniversary: A special variation of the Machin design appeared in 1990 to celebrate the 150th anniversary of the first British stamps. These consisted of a design including Queen Victoria (from the Penny Black stamp of 1840) and the familiar Machin-designed Queen Elizabeth II. Self-adhesives: In 1993, the first self-adhesive NVI Machins appeared. To test their popularity, a new horizontal format with the Machin portrait was used. 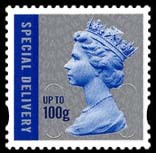 When Royal Mail was satisfied that self-adhesives were successful and no longer needed to be tracked, the stamps reverted to the normal vertical format. 1993 Elliptical perfs: Also in 1993, syncopated perforations appeared. Two large, elliptical perforations, one on each side, were added to the Machins. These were to deter counterfeiting and have become standard on all British definitives. New portrait: In 1997, the Machin portrait was modified to take advantage of computerization of the printing process. The new version is much sharper with well-defined details. In comparison, the original version appears blurred. 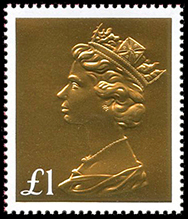 A completely new set of Machins was issued during 1997 with the redrawn portrait. Wales stamps drop 'P': Regional stamps issued from Wales no longer include the 'P' to the right of the value. Four values were issued in mid-1997: 20p light green, 26p rust, 37p amethyst, 63p emerald. "E" NVI: In January 1999, a new non-denominated stamp was issued to pay the letter rate to the rest of Europe. The service indicator is simply "E". New engraved Machin high values were issued in March 1999 to replace the castle designs that had been in use since 1988. Millennium NVI: In January 2000, a new non-denominated stamp was issued in honour of the Millennium. 'Penny Black' NVI: To celebrate the 160th anniversary of the Penny Black, the Machin design introduced 10 years previously was used again. Wales Bilingual: The Wales NVI design became bilingual. Self Adhesives: Self-adhesive Machins became more commonplace. Machins replaced? : New regional stamps are issued that begin to replace the Machin design. New values? : NO new values were issued in 2001! Airmail: Non-denominated airmail Machins released for Europe and Worldwide destinations. High-value engraved Machins re-printed by photogravure. Airmail: Non-denominated airmail Machins released for Postcards. (some of the above history is a taken from an article by Great Britain stamp expert Larry Rosenblum in a June 1999 article in Scott Stamp Monthly). Disclaimer: We apologize for any errors of information that might be present. Your feedback is appreciated. handbook available anywhere) by Douglas Myall - click for details.